If you are computer-aholic and working on computer for long time then you must be getting tired and your eyes also get tired. Flux is a software which sets your computer display according to the light required during the day. 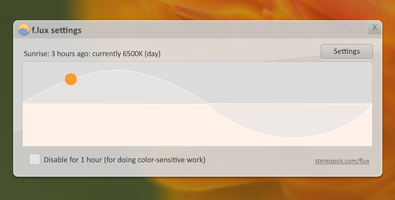 Flux makes the color of your computer's display adapt to the time of day, warm at night and like sunlight during the day. Flux makes your computer screen look like the room you're in, all the time. When the sun sets, it makes your computer look like your indoor lights. In the morning, it makes things look like sunlight again.